Calling it "a victory for America's seniors," President Bush on Monday signed into law a landmark Medicare reform bill including a new prescription drug benefit. Mr. Bush said the measure, estimated to cost $400 billion over the next 10 years, would give older Americans "better choices and more control over their health care, so they can receive the modern medical care they deserve." 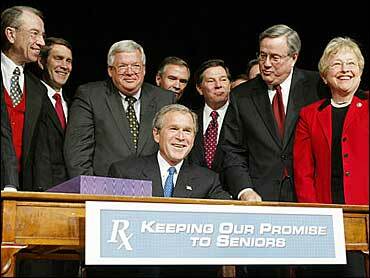 "Our government is finally bringing prescription drug coverage to the seniors of America," Mr. Bush declared. The Bush administration made such a big to-do out of the signing ceremony that it was staged not in the White House but in the larger auditorium of nearby Constitution Hall, reports CBS News Correspondent Mark Knoller. The president spoke in front of a large blue banner with a prescription sign and the words: "Keeping Our Promise to Seniors." "I'm pleased that all of you are here to witness the greatest advance in health care coverage for America's seniors since the founding of Medicare," Mr. Bush said. He said then-President Lyndon Johnson, when he signed the Medicare Act of 1965, established a "a solemn promise to America's seniors. We have pledged to help our citizens find affordable medical care in the later years of life." "And today, by reforming and modernizing this vital program, we are honoring the commitments of Medicare to all our seniors," Mr. Bush said. The most significant part of the legislation adds prescription drug coverage to the federal health insurance program for the elderly, starting in 2006. Beginning next May, seniors can buy a Medicare-approved discount card for $30 or less to help offset the growing costs of prescriptions. But a wide array of other pilot programs are meant to tweak the Medicare system, and will add to the cost of the changes Mr. Bush signed. One of the costliest among them sets aside $500 million for a two-year, six-state effort for at least 50,000 patients to cover a limited category of self-administered prescription drugs. "No less than 40 percent of the funding shall be for oral cancer," Congress directed in a report accompanying the bill. Other programs are designed to help health care providers and their patients, including a two-year program to cover chiropractic services without prior approval by a medical doctor. Still others are aimed at attacking waste, such as a three-year provision to allow Medicare to contract with private firms for "identifying underpayments and overpayments and recouping overpayments." The bill encourages insurance companies to offer private plans to millions of older Americans who now receive health care benefits under terms fixed by the government. Democrats charge the plan is a sellout to drug companies — and pointed out the bill's prime supporters have received $14 million from the health care industry, reports CBS News Correspondent John Roberts. Even before he signed the legislation, Democrats stepped up their criticism. House Democratic leader Nancy Pelosi of California, Sen. Edward M. Kennedy, D-Mass., and other opponents scheduled a rally with seniors to underscore their claim the measure threatens Medicare's future. "Many people will wake up and discover that the Medicare bill is a cruel hoax," Sen. Hillary Rodham Clinton, D-N.Y., told reporters Sunday. "It does not provide the kind of benefits that they had hoped for, and it will lead to the undermining of Medicare traditionally." Even some of Mr. Bush's fellow conservatives have questioned the price tag of the reforms, which come at a time when next year's budget deficit is projected to be some $500 billion. "The U.S. budget is out of control," Goldman Sachs economists said last month. In contrast to the major changes, more than a dozen short-term adjustments to Medicare are embedded in the bill. Often, they were included at the behest of individual lawmakers, some of whom may have wanted a permanent change but settled for less. Beginning in 2010, the bill provides for a six-year program under which new private plans will compete directly with traditional Medicare in a few areas around the country. Critics said it will lead to Medicare being put under private control. Even some of the bill's Republican supporters, hoping to shield seniors from the possibility of higher premiums, lobbied to have their states exempted from the test. By contrast, other temporary provisions generally prompted little or no public notice. The pilot program for background checks at long-term care facilities is designed to reduce patient abuse and is a longtime interest of Sen. Herb Kohl, D-Wis. At a two-year cost of $25 million, it would set up programs in up to 10 states for checks on workers who come in direct contact with patients. Prospective employees would be required to submit fingerprints to the facilities, which would work with states to check them against an FBI database. "Disqualifying information for employment includes information about a conviction for a relevant crime, a finding of patient or resident abuse or a felony conviction related to health care fraud or a controlled substance," said the report accompanying the bill. Officials said the five-year program for rural hospice care stemmed from an issue raised by Mississippi's Republican senators, Thad Cochran and Trent Lott. That program would make it easier for rural, terminally ill Medicare recipients who live far from hospice facilities to receive more care.